The Tether Tools Vu Booth is a quick, easy, and inexpensive way to create a photo booth for events, weddings, or parties. Designed with the on-the-go photographer in mind, the Local Vu PhotoBooth System serves many photo display needs, travels easily, and will not break the bank. The Tether Tools Local Vu Booth is a quick, easy, and inexpensive way to create a photo booth for events, weddings, or parties. Designed with the on-the-go photographer in mind, the Vu Booth serves many photo display needs, travels easily and will not break the bank. The Vu Booth is a modular booth setup designed to utilize existing equipment so purchasing an expensive, cumbersome, use-specific photo booth is not needed in order to offer clients a photo booth option for their events. 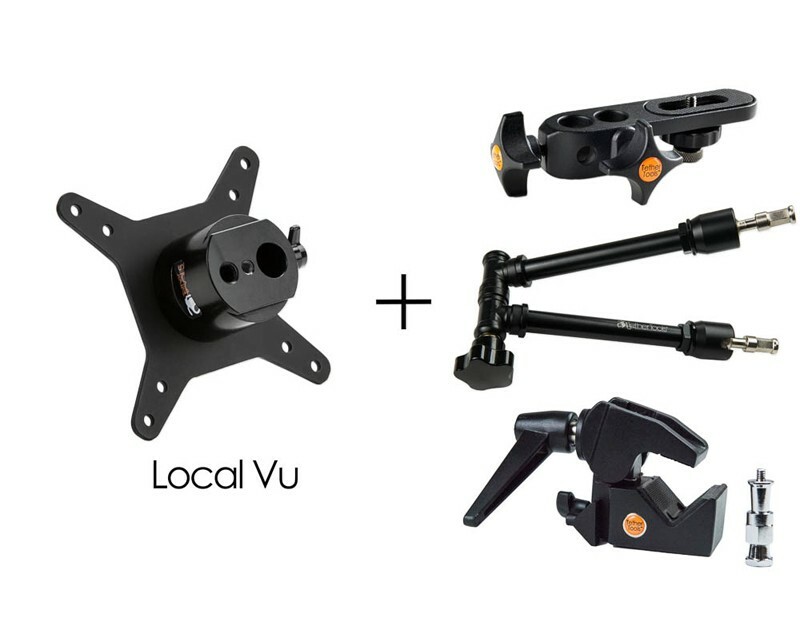 The Vu Booth Kit contains the one Local Vu Monitor Mount, Rock Solid Master Arm, Master Clamp, and Camera Mounting Platform. The Tether Tools Vu Booth sets up in minutes. Easily connect any VESA compliant 75×75 or 100×100 monitor to the Vu Monitor mount. Once mounted, the monitor can easily rotate from landscape to portrait position. For added stability, use of a sandbag is recommended. The camera platform mounts any camera on top of, below, or to the side of the monitor. Monitor notes: for larger monitors, with larger VESA patterns, the VESA Vu 200×200, 200×400, and Universal adapter plates (sold separately) have been created to meet just about any monitor’s specifications. If you plan to mount an Apple iMac and/or a Cinema Display, a special adapter plate (available at Apple.com) is required. Please note the Vu Booth does not include a tripod, stand, monitor or photobooth software. If mounting the Local Vu on a Junior 1-1/8″(2.85cm) stand or a Baby 5/8″ (16mm) pin the Rock Solid Aero Elbow is recommended to angle and position the monitor in the desired location. Easily mount any montitor on the column of a stand or any flat surface with the Rock Solid Master Clamp. The use of a sandbag on the stand or tripod is recommended. Angling of monitor can be achieved using tripod ballhead achieving 360 degree rotation and 180 degree tilt. When using the 5/8” baby junior stand, a swivel pin (sold separately) can be used to achieve 360 degree rotation and 180 tilt for the perfect viewing angle. Monitors can be easily rotated from landscape to portrait when using ballhead receptor. *The Local Vu is rated to hold equipment up to 35 lbs(15.88kg). However, always refer to maximum load limits on stands, arms, and clamps. Those weight limitations ALWAYS take precedence. For larger monitors, always position the display over one of the stand or tripod legs. The use of a sandbag on the leg opposite the monitor is recommended. This listing is for the Local Vu monitor bracket attachment only. All other items pictured are sold separately. Baby 5/8"(16mm) Socket enables use of a wide variety of attachments including the Rock Solid Master Articulating Arm, Rock Solid Double Articulating Arm, Camera Platform, Rock Solid Aero Elbow , Baby Ballhead Adapter and more. Securely attaches to round and flat surfaces from 0.5" to 2.1"